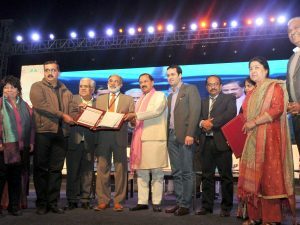 Under ‘Adopt a Heritage: Apni Dharohar, Apni Pehchaan’ project, Letters of Intent for 40 monuments to nine agencies of Phase-II and Letters of Intent for 22 monuments to eight agencies of Phase-III were handed over by the Minister of Culture and the Minister of Tourism, during the closing ceremony of ‘Bharat Parv’ held at Red Fort. The project was launched to preserve the rich cultural and natural heritage and promote tourism across the length and breadth of our country. In addition, the MoUs were signed with Adventure Tour Operators Association of India (ATOAI) and State of Jammu & Kashmir for two natural sites, namely, Mt Stok Kangri trek route, Ladakh, J&K and Gangotri Temple Area & Trail to Gaumukh, Uttarakhand. Addressing on the occasion, K.J. Alphons, Minister of State for Tourism said that the ‘Adopt a Heritage’ project plans to entrust heritage sites to private and public sector companies, and individuals for the development of tourist amenities. The basic and advanced amenities in the tourist destinations would be provided by them. He called upon people to actively take part in the Swachhta Abhiyan for cleanliness in tourist destinations. 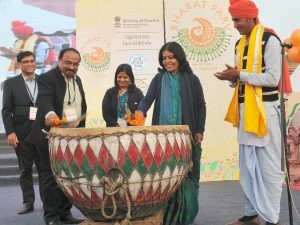 ‘Bharat Parv’, an event conducted by the Ministry of Tourism has been promoting the rich cultural diversity of India whilst ensuring wider participation of the general public. 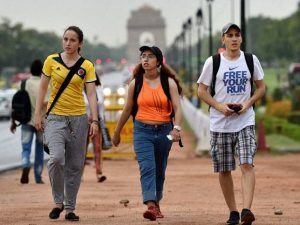 The event kicked off on January 26 at Red Fort, Delhi as part of the Republic Day 2018 celebrations. Rashmi Verma, Secretary, Ministry of Tourism inaugurated the event. The highlights of the event include display of Republic Day parade tableaux, performances by the Armed Forces Bands, a multi-cuisine food court, craft mela, cultural performances from different regions of the country and photo exhibition by the Directorate of Advertising and Visual Publicity (DAVP). The cultural performances include choreographed tribal dances and music as well as performances by cultural troupes from different states. The food court has stalls set up by the states/UTs, National Association of Street Vendors of India (NASVI) showcasing street food from different regions as well as by the Institutes of Hotel Managements and ITDC. The Crafts Mela with 50 stalls showcases the diverse handicrafts of the country, arranged by the State Governments and Ministry of Textiles through the office of the Development Commissioner of Handicrafts. The Ministry of Tourism is set to organise ‘Bharat Parv’ at the Red Fort, Delhi from January 26-31, 2018 as part of Republic Day 2018 celebrations to promote India’s rich cultural diversity and ensure wider participation of the public. The highlights of the event include display of Republic Day parade tableaux, performances by the Armed Forces Bands, a multi-cuisine food court, craft mela, cultural performances from different regions of the country and photo exhibition by the Directorate of Advertising and Visual Publicity (DAVP). The cultural performances include choreographed tribal dances and music as well as performances by cultural troupes from different states. The food court will showcase street food from different regions while the craft mela with 50 stalls will display diverse handicrafts of the country. A live ‘Cookery Demonstration Area’ is being set up in the food court to promote cuisines of different states. The Bharat Parv event will be inaugurated at 5.00 pm on January, 26 and would be open for public till 10.00 pm. The event is open for public and entry is free with a valid identity proof. Ministry of Tourism has streamlined the hotel classification guidelines to make them simple, transparent and time bound. The application for classification and payments of fees have been made through digital platform only, ensuring the eradication of possibility of delay or manipulation caused by human interference. The recent amendments have included a time limit of three months, thus removing any discretion in the matter. This will ensure a time bound compliance and speedy disposal of cases. The amendments have made it clear that liquor shops in the premises of the hotel other than bars will not be considered for classification under star hotels “with alcohol” category, to remove any ambiguity. 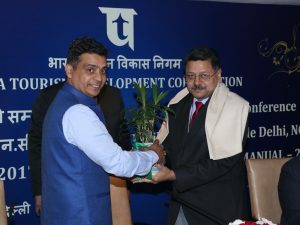 It has been made mandatory for all the hotels classified under all categories to display their classification status prominently at the reception and on their websites under a separate icon on the opening page, which will display the order of classification issued by the Ministry of Tourism, Government of India. The amendments have included a detailed timeline within which the classification has to be completed. In every case where the required documents and procedures are fulfilled, the classification will be completed within 90 days. The number of Foreign Tourist Arrivals (FTAs) in December 2017 was 11.76 lakh as compared to FTAs of 10.21 lakh in December 2016 and 9.13 lakh in December 2015. The growth rate in FTAs in December 2017 over December 2016 has increased to 15.2 per cent, compared to 11.9 per cent in December 2016 over December 2015. FTAs in 2017 were 101.77 lakh with a growth of 15.6 per cent over 2016, compared to FTAs of 88.04 lakh with a growth of 9.7 per cent in 2016 over 2015. The percentage share of Foreign Tourist Arrivals (FTAs) in India during December 2017 among the top 15 source countries was highest from Bangladesh (19.04%) followed by USA (16.90%), UK (10.41%), Australia (5.31%), Canada (3.85%), Russian Fed. (3.79%), Malaysia (3.11%), Germany (2.08%), China (2.06%), Sri Lanka (2.01%), Singapore (1.85%), France (1.81%), Japan (1.64%), Thailand (1.60%) and Italy (1.44%). The percentage share of Foreign Tourist Arrivals (FTAs) in India during December 2017 among the top 15 ports was highest at Delhi Airport (25.80%) followed by Mumbai Airport (17.31%), Haridaspur Land Check Post (9.75%), Chennai Airport (6.36%), Bengaluru Airport (5.33%), Dabolim (Goa) Airport, (5.29%), Kolkata Airport (4.95%), Cochin Airport (3.92%), Hyderabad Airport (3.02%), Ahmadabad Airport (2.63%), Gede Rail Land Check Post (1.94%), Trivandrum Airport, Trichy Airport (1.44%), Ghojadanga Land Check Post (1.26%) and Sonauli Land Check Post (1.14%).